Tempered Glass Market size was over USD 24.5 billion in 2016 and industry expects consumption above 4.3 billion square meters by 2024. Increasing application scope in automotive and construction industries along with increasing consumer demand for improved infrastructure facilities should drive tempered glass market size. It is mainly produced by controlled thermal process or chemical treatment to increase its overall strength. Increasing tempered glass demand in automotive industry mainly in rear and side windows owing to its superior properties such as safety, durability, thermal shock resistance, reliability and tensile strength should stimulate industry growth. The products must be in compliance with OEM standards which are either sourced from suppliers or original equipment manufacturer. Global automotive industry may surpass USD 3 trillion by 2024. Europe’s motor vehicles production was over 18 million units in 2016. Technological advancement along with strict government norms regarding reducing carbon emission to enhance vehicle safety should drive automobile market demand. Germany, France, UK, Spain, and Italy are the largest automobile market owing to increasing consumer demand for luxury & premium cars, easy car financing accompanied with government incentives and high economic conditions will have a positive influence in the industry growth. Increase in infrastructure spending in China, India, Malaysia, Brazil, and Philippines along with rise in need for durable building materials should drive tempered glass market size. Global construction industry was valued at over USD 8 trillion in 2016 and is poised to surpass USD 10 trillion by 2024 owing to increasing government investments in infrastructure facilities. Construction spending in Asia Pacific accounted for over 40% of the total demand in 2016. Rapid industrialization along with expanding foreign investment funding should drive regional industry growth. Rising architectural facilities towards and increasing application in building facades may fuel product demand. Tempered glass is available as single, double and triple pane types. Increasing application scope in greenhouse sector as it provides four to six times more shatter resistance than annealed types which should stimulate tempered glass market demand. Increasing awareness regarding energy efficient and greener building will propel the industry growth. It is highly preferred for greenhouse construction to maximise heat-reflecting properties in hot climates, which provides an aid in blocking the heat more effectively. Moreover, these products prove to be an ideal choice for greenhouse construction due to its ability to withstand contraction and expansion during seasonal temperature changes. Major raw materials used for manufacturing this product includes nickel-sulfide, calcium oxide, silicon dioxide, and sodium oxide. Volatility in raw material costs owing to increasing usage in construction and automotive industries may pose threat to industry profitability and affect tempered glass market price trend. Tempered glass market size from construction applications may register gains close to 5.5% by the end of forecast period. It is used for building facades, glazed doors, partitions, shower enclosures, canopies, and wash basins. Increasing government spending and favourable schemes in construction sector coupled with stringent regulations related with the consumers safety should propel industry growth. Tempered glass market size from commercial construction should surpass USD 12.5 billion by 2024. It is widely used in various commercial buildings such as offices complexes and public buildings along with supportive regulations regarding product usage will stimulate industry demand. Changing lifestyle patterns along with safety needs and demand for better infrastructure has led to growth of construction output in China, India and Brazil thereby stimulating market demand. 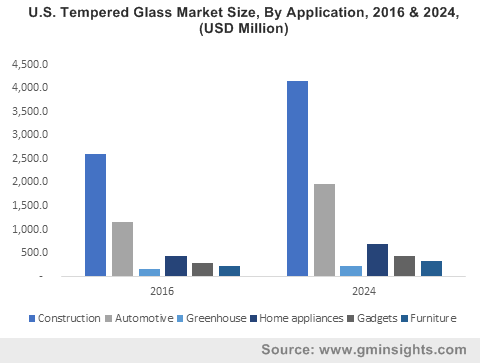 Tempered glass market size from home appliances may witness significant gains at over 5% by 2024. Positive application outlook in washing machines, refrigerators, cookware and microwave ovens will boost product demand, thereby providing safety, and anti-breakage properties. Tempered glass market size from gadgets applications should exceed USD 2.1 billion by 2024. These are widely used in smartphones, tablets and laptops or computers as screen protectors. Increase in smartphone penetration in South Korea, Poland, Brazil, Taiwan and Australia has led to adoption of toughened glass demand. Increasing demand for furniture including table tops, shelves and cabinets and other interior applications should stimulate toughened glass market size. Tempered glass market size from furniture applications should witness significant gains up to 2024 owing to increasing demand for innovative furniture designs for interior applications accompanied with improving lifestyle patterns of consumers. Europe tempered glass market size, driven by Germany, France, UK, and Russia should register growth at over 3.5% by 2024. Increase in smartphone penetration and presence of major automobile companies along with strong economic conditions is expected to propel regional industry growth. China tempered glass market size should exceed USD 4.5 billion by 2024 owing to its wide application scope in construction and automotive sectors. Increase in government spending for various green building facilities accompanied with growth towards central National New-Type Urbanization Plan and investment by foreign manufacturers in Chinese factories should favor industry growth in the region. Brazil tempered glass market size should witness significant growth at over 5.6% by 2024. Increase in urban population along with improving economic conditions should drive industry growth. Increasing popularity of various home appliances including refrigerators, washing machines and microwave ovens is expected to propel regional industry growth. 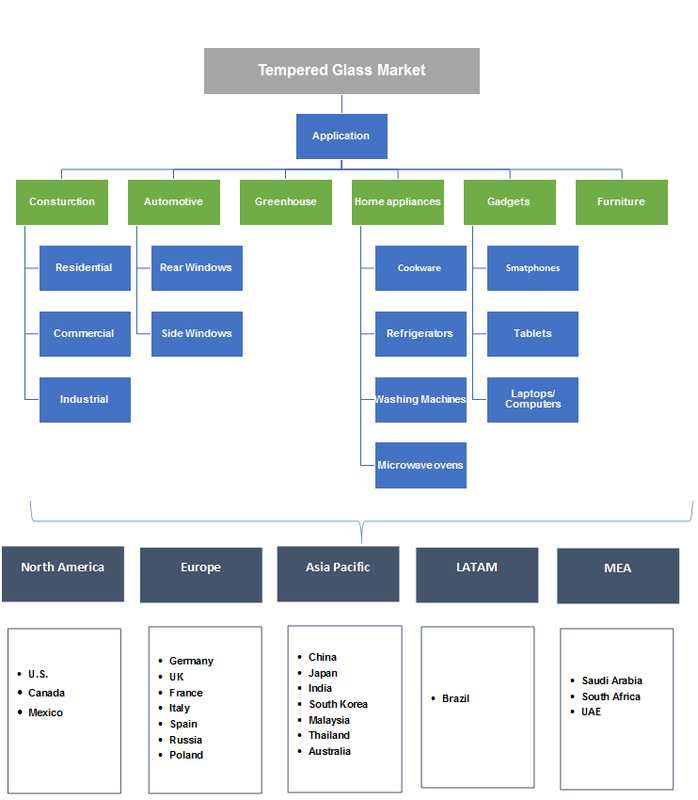 Global tempered glass market share is moderately fragmented and competitive with some of industry participants include Saint-Gobain, Asahi, NSG, Guardian Industries Corp, Abrisa Technologies, Fuso, and PPG Industries catering to domestic and international market. Manufacturing companies are focusing on strengthening regional presence and expanding business by developing strategies to size up production capability and enhancing product portfolio. Companies are also engaged in forming partnerships and acquisitions with regional & local companies to open new market opportunities, and further accelerate tempered glass market demand. Tempered glass, also known as toughened and safety glass is a product made from heat treatment or chemical processes to increase its strength. This product is first heated through chemical process which hardens it and rapidly cooled with the help of blowers. This product is approximately four times stronger than normal glass and majorly used for safety purposes as it breaks into small granular chunks rather than sharp edges thereby preventing damage and injuries. Strong application outlook in automotive, construction, furniture, and home appliances, along with its superior properties is expected to fuel product demand.